How does the Scalewizard work? 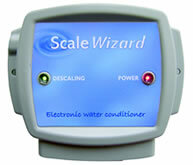 The Scalewizard uses modern technology to create an electrical field that changes the behaviour of scale forming calcium. This action stops further build up of scale and as the solubility of the water is increased, existing scale will be reduced. How can I tell if it's working? - Improved performance of washing machines and dishwashers. - You may find you use less soap powder and detergents. - Easier cleaning of surfaces, especially baths, basins and sinks. Where does the scale that is removed go? It is dissolved gradually into the water and the water goes down the drain. Does it affect the drinking water? Water remains chemically unchanged, retaining the beneficial minerals and tastes the same so you do not need a separate drinking tap. Can I fit the unit? As no plumbing is involved, most customers fit the unit themselves and it should take no more than 30 minutes, or you can use a local handyman or electrician. Does it require any maintenance? Once installed, the unit will require no maintenance at all for its expected life span of 10 - 20 years or more. What pipe material is suitable? The unit can be fitted on copper, plastic, steel or lead pipes. Where should the unit be fitted? The ideal place is on the rising main so all the water that enters the house is treated, but if necessary, it can be fitted further up the system. How much pipe is needed for installation? To fit the unit, you require 10 cm of straight pipe. This can be horizontal, vertical or diagonal pipe. However, you can treat two pipes with one unit. The unit costs about £3.00 a year in electricity. We can normally solve most problems. If we can't, you get your money back. Can I use it anywhere in the world? Yes as long as there is a 220/240 volt supply we will send to any country. See order page for delivery costs.